Just two days ago 358 of the world's greatest players took to the felt for Event 6: $5,000 No-Limit Hold'em Shootout. 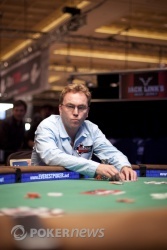 It has been stated that this event boasts one of the strongest starting fields in any World Series event, and this was underlined with some of the toughest starting tables ever witnessed as Phil Ivey, Daniel Negreanu, Chris Ferguson, Barry Greenstein and Phil Hellmuth were joined by sit-n-go masters and online prodigies. 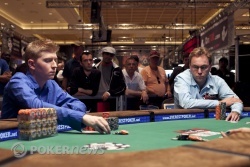 However only thirty-six players would survive day one with Dario Minieri, John Duthie, Chad Brown, Tom Dwan, James Akenhead, Faraz Jaka, Chino Rheem and Chris Ferguson just a few of those looking at capturing a 2010 bracelet. Unfortunately the more recognizable names would fall to the rail as a final table of six would be set with a purely USA versus Europe element. The UK’s Neil Channing and Stuart Rutter along with Frenchman Nicolas Levi would be waving their respective flags against the Stars and Stripes of Brent Hanks, Joseph Elpayaa and Joshua Tieman. Hanks was clipped by fellow countryman Elpayaa early and never was able to recover as he bowed out first before being followed by Levi and Elpayaa as their tournament was ended by Tieman as he took more than half the chips into three-handed play. Soon that was cut down to heads up play once Rutter’s dominated ace failed to improve as Tieman and Channing sat down exactly the way the day started – USA versus Europe. The six-to-one chip advantage that Tieman held soon increased to an eleven-to-one one before Channing – like fellow countryman Rutter – committed the last of his chips with a dominated ace against Tieman. 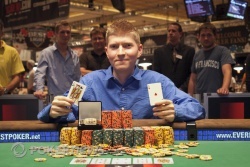 No suckout would occur and Tieman would not only record his tenth WSOP cash but also win his first gold bracelet while increasing his live tournament earnings three-fold. PokerNews would like to congratulate Joshua Tieman on an excellently played tournament composed of patience, poise and excellent decision making to be crowned the Event 6 Champion and recipient of a World Series of Poker gold bracelet and $441,692 in prize money. While it is an early finish to Event 6, make sure to check out some of the live updates from the PokerNews Live Reporting Team as we provide exclusive coverage of the 2010 World Series of Poker from the Rio. Joshua Tieman is the winner of the 5k Shootout! Neil Channing Eliminated in 2nd Place ($273,153); Joshua Tieman Wins! Neil Channing eliminated in 2nd. Neil Channing was short throughout the final table, but he parlayed the aggressive play from others with his own mastery of the game to reach a heads up match with Joshua Tieman. Channing was unable to overcome the near 7:1 chip advantage though, and after about a dozen hands of heads up we have a champion. The dealer wrapped the table and flopped . No help for Channing. The on the turn paired the board, keeping the door cracked open a bit. It slam shut with the on the river. The English professional was so close to his first WSOP bracelet, but he will have to settle for second place and $273,153. Neil Channing limped in from the button and Joshua Tieman made it an additional 75,000 which Channing called. The flop fell down and Channing quickly folded to Tieman's 105,000-chip bet as he slips to just over 700,000 in chips. Some photos of the heads up action. Joshua Tieman raised to 80,000 with the button and Neil Channing called. The flop fell . Channing check-called 85,000 from Tieman and both players checked the turn. The river brought the and Tieman led for 160,000. Channing folded and Tieman showed . Channing is down to just 751,000 chips. 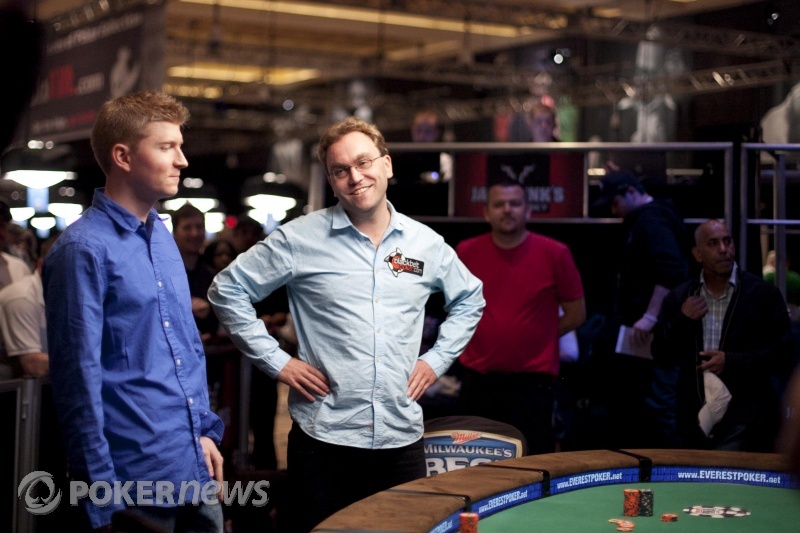 The first few hands of heads up between Neil Channing and Joshua Tieman have been back and forth. One of the initial hands, Channing limped on his button and Tieman raised to 100,000. Channing called. The flop fell Tieman led for 115,000. Channing called. Both players checked the on the turn, and the river brought the . Again both players checked and Tieman opened for a pair of sevens. Channing mucked and Tieman was awarded the pot. Channing gained revenge a few hands later. He again limped in, Tieman checked and the flop came . Both players checked and the turn was the . Tieman led for 60,000, Channing raised to 115,000 and Tieman folded.